Suggesting Tamperproof Documentation at Mangalore City Corporation. 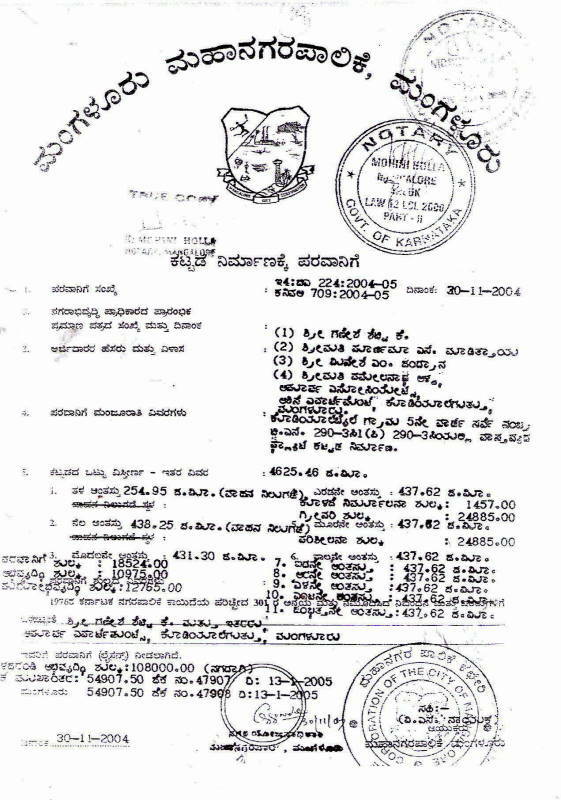 Unauthorized Construction & cheating the buyers of Flats in Mangalore. It is observed that there is a great scope for cheating the buyers of flats in Mangalore. We tried to find out why cheating is so rampant by the Building construction industry. Builders build unlicenced pent house on the terrace and unlicenced office / flat in the car-park. Terrace and Car-park defined as common areas. They even construct a go-down on the basement car-park. Builders do not even submit to MCC the floor drawings of basement, ground floor car-park and Terrace. Terrace should have Lift Machine Room, Staircase Head Room and Over-head Water Tank. Remaining areas of terrace should be open space. This should be clearly shown in the drawing for the terrace. Before the commencement of the construction, builder / developer has to submit the building plan for approval and obtain Building License / Building permit. We observe that building plan incorporates the followings. Table for FAR calculation is given,. City corporation officials & Commissioners signatures. Floor plan for basement, ground floor and Terrace are missing in the approved drawings. We are happy to know that MCC has taken steps to initiate periodic inspection of the construction of a building at every stage. We sincerely believe that the MCC is really interested in regulating the Process of Building Construction /system very efficiently and would like to plug the loopholes in the documentation of Approved plan & building licence. The following should be added to the existing format of approved drawing & building license to make the process tamper-proof. 1.Drawings for basement & terrace should also be included for the approval of the Plan, as misuse of basement car park (with go-down) and Terrace (with pent house) are observed. Terrace should only have 3 items as mentioned in the first paragraph. 2.Table for undivided share of Land should be included in the approved drawing & building license as it is observed that builders retain illegally some percentage of land with themselves. Total land has to be shared with the legitimate flat buyers only. Undivided Share of Land = (Total Land area / Total built up area) x individual Flat built up area. Flat area Sq.ft 1500 18 1000 18 45000=a.b+ c.d+ e.f This should tally with the figures in the total of FAR table. USoL sq.ft Total extent of Land=a.b+ c.d+ e.f This should tally with the total Land area. By this way undivided share of Land and total built-up area are frozen in the MCC documents and becomes tamper proof. Builder -then-can not have any opportunity to construct unauthorized flats / office / go-down. With inclusion of this, the approved PLAN & BUILDING LICENSE become foolproof. To implement this suggestion, MCC must develop a software to generate building license automatically on entering the data pertaining to land area, total built-up area and individual flat areas so that so called human error, if any, is eliminated. Recently the Supreme Court has ruled that builders/promoters cannot sell parking areas as independent units or flats, as the same is to be extended as "common areas and facilities" for the owners. A Bench of Justices R. M. Lodha and A. K. Patnaik, in a judgment, rejected the argument of a real estate development company that they are entitled to sell garages/stilt parking areas as separate flats to owners who intend to use it as parking facilities. "If a promoter does not fully disclose the common areas and facilities, he does so at his own peril. Stilt parking spaces would not cease to be part of common areas and facilities merely because the promoter has not described the same as such in the advertisement and agreement with the flat purchaser. "The promoter has no right to sell any portion of such building which is not 'flat' within the meaning of Section 2(a-1) and the entire land and building has to be conveyed to the organization. The only right (that) remains with the promoter is to sell unsold flats. "It is, thus, clear that the promoter has no right to sell 'stilt parking spaces' as these are neither 'flat' nor appurtenant or attachment to a 'flat'", Justice Lodha said. A copy of the news report is enclosed. We know that the MCC has no role to play in the commercial transaction between builders and the flat buyers. But it is the responsibility of the MCC to ensure that approved drawings include properly numbered car-park drawings for basement and ground floor is submitted to MCC for approval. The above mentioned judgment indicates the importance of meticulously following MCC rules. MCC can not ignore the implementation of its own Rules. MCC should have a system of black listing those builders who violate the MCC's rules and Laws of the Land. Please Refer to the excerpts from some SUPREME COURT judgments in the past and excerpts from Karnataka Ownership flat (Regulation of the promotion of Construction, sale, management and transfer) Rules 1972 to support our arguments. 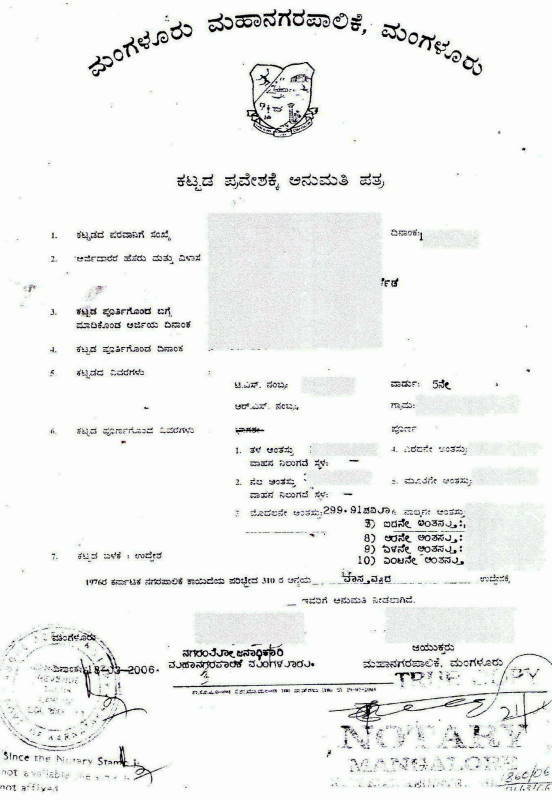 Building Licence & Completion Certificate. 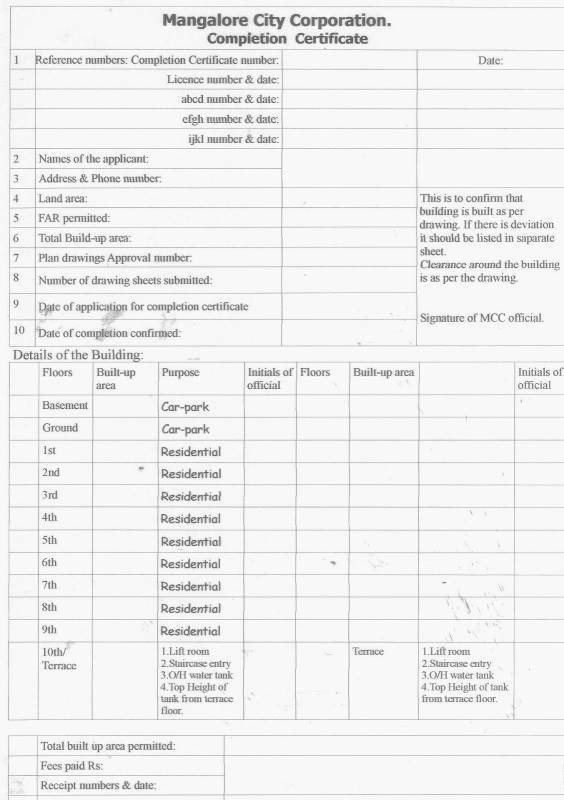 Present Building Licence formate from MCC is given below. There is no mention of Undivided Share of Land for different sizes of flats. Therefore, flat buyers can not relate to the figure for undivided share of land mentioned in Land Document. The present completion certificate formate from MCC. Here also no mention of Undivided share of Land in this document.We suggest to include USofLand in both these documents of the MCC. This suggested formate ensures undivided share of land for all sizes of flat are not hidden but declared at the licence stage itself. Total permissible built up area is also very clearly declared. Sum total of USof Land of all the flates has to be equal to total land area. Similarly sum total of built up area of all the flats can not be more than the licenced builtup area. 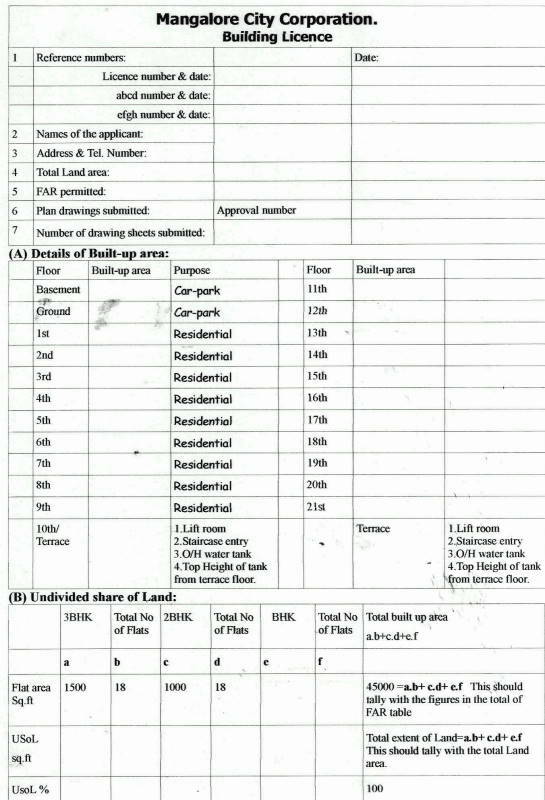 Total built up area of all the flats mentioned in this suggested form must tally with the figures in the building licence. Inspecting officials initials for every floor should be necessary.